Just when you thought you'd seen the last of the blog hops, here's another one! 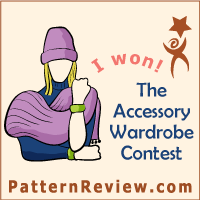 I was nominated by Andrea of Fabric Epiphanies, Carolyn of Handmade by Carolyn and Andrea of Obsessive Creativeness. Thank you all and sorry for taking so long to write this. When I was at high school I hated to write. Actually, I pretty much hated anything to do with school and didn't go very often! Then, after failing my final year, learning some life lessons and repeating my final year, I found myself studying Biology at uni and barely able to write a lab report. Fortunately for me, my Mum has incredible English skills and she spent many long hours imparting her knowledge to me. I am eternally grateful for this. A new world of creativity, expression and grammar nazism opened up to me and I loved it all. As I moved on to do my PhD. I wrote as I went along and, to the amazement of my supervisor, submitted my thesis three weeks after finishing my experimental work. What a relief that was after five, long years! By this stage I had honed my scientific writing skills to a fine art. My writing was specific, concise and exact. Eventually I left the lab altogether and worked as a Medical Writer for a company that ran clinical trials. Then came the blog. A sewing blog written in a highly scientific style just doesn't work. I wanted it to be readable and fun. It was snotty and boring. I tried to inject my sense of humour. It fell flat. I struggled for a long time to wrestle that scientific perfectionism out of the blog and I think I've managed it sometimes! Occasionally I think I've written things that are even a bit witty or funny and even used superfluous words I didn't really need! So the short answer is that I write because I love it. Fiddling with sentences to get them just right is as much fun in blogging as in science, just completely different. Why is your blog different to others in the same genre? I don't think it is much different. There are an awful lot of sewing blogs written by scientists (I must research that sometime...). I make things I want to wear, try to take good photos and then write something interesting or useful or humorous to go along with the pictures. Pretty standard really. As always, I'm working on trying to keep up with all the fantastic sewing blogs on my list, attempting to memorise (and prioritise) all the patterns in my Burdastyle and Patrones magazine collection and ogling the entries in the PR Sewing Bee competition and wishing I was still part of it. I've just made myself a leather bag and have started on my Christmas sewing, so that's a secret. My writing process starts with a series of unblogged projects and much procrastination. Much as I love writing, I would still rather sew. Getting the photos taken is a big hurdle, recently made easier with my home made studio background that I will blog about soon. Then I just sit and bang out a blog post, usually in one sitting, click 'publish' and rush off to catch up on making dinner or whatever has been neglected while I sat at the computer! I have found blogging easier over time and I rarely go back and change anything these days, where at first I was constantly editing what I had written. I try to blog when I'm in a good mood so I can keep the content upbeat. Sometimes I think about a blog post before I write it and try to come up with a good pun I can use, but mostly I just try to be me and my writing reflects my serious or silly state of mind at the time. Great post and also quite inspiring! My daughter who has just finished High School (last year 13 exam today to be exact) intends to study science next year at Uni. I must show her your post. As much as she supports my sewing and enjoys it sporadically herself, there is a part of her that finds it shallow so it would help her to see that it is an interest that is participated in by all walks of life. Is there some link between science and sewing because there seem to be quite a few science based sewing bloggers out there? I am intrigued by your DIY photo booth. I soo need one if those because photographs are one thing I do struggle with especially in the winter months. I nominated you because I really like both what you make and the way you present it both in photos and writing. Keep up the good work! Thank you for the thoughtful comment, nomination and all the support over the years! Congratulations to your daughter too. I loved studying biology and I have always been pleased that I know how the body works and how to properly research anything I don't know. It comes in handy so often, not least when a family member is sick. My experience has also showed me how important it is to effectively communicate ideas. There's no point knowing things if you can't tell other people about them! I have often wondered about the science/sewing connection. Maybe it's something to do with being exact and precise. Good fashion sense is certainly not common to all scientists though! Brilliant! "Unblogged projects" and "procrastination" are what I'm doing right now, actually! Nice to know more about you; I remembered you are a scientist (arriving somewhere with a sewing machine in the snow) but I would never have guessed you used to skip school and found writing anything but natural. Ha, you have a good memory! Yes, my sewing machine and I moved to snowy Montreal for three years when I was 27. What a shock that was. Aw, thank you. I'm glad I'm not the only one who struggles with the writing style! As always an interesting read. I too struggle with letting the scientist go - now I am trying to write a primary teaching CV which I am told should be much more fluffier!!! than my "just the facts ma'm" science CV. Love your take on sewing!! Write a professional CV and make it 'fluffy'? Perish the thought! I couldn't possibly do that. How interesting. I loved the medical writing process, but the deadlines could be a bit stressful I bet your job is super interesting (now I'm worrying that I wrote 'interesting' twice in the same comment!). Interesting post with quite fruitful information! I heartily appreciate the perfect blend of words and photographs. I have the courage to confess that science goes over my head. The way you narrated your love towards sewing is incredible. I just think you're super fab at all you do.